A staggering 84 percent of New York City fast food workers reports having been a victim of wage theft, a new survey finds. Things are even worse for fast food delivery workers—100 percent of them report wage theft. The New York State attorney general is reportedly investigating pay practices in New York City fast food, and the new survey and report from Fast Food Forward offer a detailed picture of what that investigation might find. Employers cheat workers out of wages in a number of ways, forcing them to work off the clock before or after their shifts or during break times, not paying overtime when workers work more than 40 hours a week, making delivery workers pay for equipment they're required to have to do their jobs, or just plain not paying the minimum wage. paper paychecks and even direct deposit have been replaced by prepaid cards issued by their employers. Employees can use these cards, which work like debit cards, at an A.T.M. to withdraw their pay. The reason for the growth of the practice, you won`t be surprised to hear, is that it is a sweet deal for the participating banks like Citibank, Bank of America, JPMorgan Chase and Wells Fargo, and for the largest issuer of payroll cards, Net Spend. The banks are making swipe fees. The kind of swipe fees they were prohibited from making with regular ATM cards under Dodd Frank Financial Reform. Natalie Gunshannon, an employee at a McDonalds "restaurant" in Dallas, Pennsylvania was required to use the payroll card, sued, and quit. The joint changed its policy but Gunshannon's lawsuit is ongoing and she is seeking punitive damages. In New York State, Attorney General Eric Schneiderman has begun an investigation of the practice. These policies persist despite their impact on the working poor... or maybe because of it. While most of the progressive world and the mainstream media are fascinated with bright, shiny objects- today, "marriage equality" and immigration reform- income inequality continues to grow. 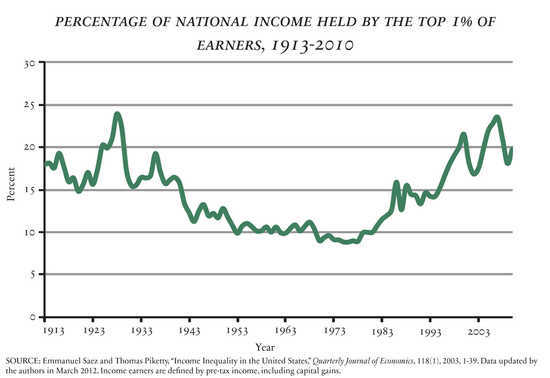 From information supplied by Emanuel Saez and Thomas Piketty and a graph (below) from nationalaffairs.com via Daily Kos, we learn that the top 1% of earners now possess 20% of the nation's income. 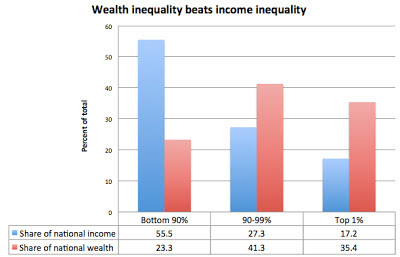 Between 1979 (shortly before the "Reagan Revolution" lauched) and 2007, real income for the top 1 percent of households (as judged by total income) rose 240.5%, by 19.2% for the middle fifth and 10.8 percent for the bottom fifth of households. Wealth is always distributed even more unequally and when in 2010 the top 1% had 17.2% of income, they controlled 35.2% of the wealth (graph, further below, from the Economic Policy Institute via Ezra Klein's Wonkblog). The generals in the financial industry have been waging class warfare in the U.S.A. for over three decades. They've won nearly every major battle, and now they're just rubbing our noses in it.